Posted on July 25, 2018 July 3, 2018 , in Hot Tubs. If you have recently bought a hot tub or are about to become a new hot tub owner, it is important to understand what the hot tub filter does, how it must be cleaned and how to know when it needs to be replaced. Although small, it’s this little component that will be largely responsible for keeping your hot tub water clean and sanitary so that you can take a relaxing soak anytime you please. In the article below, we will highlight precisely what you need to know about cleaning, changing and replacing your hot tub filter. On a weekly basis, you need to remove and rinse your filter with running water (use a hose or sink faucet). Every month, it’s encouraged to use a special hot tub cleaning spray on your filter prior to rinsing. To avoid downtime in your hot tub, buy a spare filter that can be used while your main one is soaking. Wear rubber gloves while cleaning and handling your filter when using the chemical spray and cleaners. While it’s true that hot tub filters will need to be cleaned on a regular basis, they also need to be replaced every so often to prevent wear and tear. It’s important to keep tabs on the age of your filter so that you will know when a replacement will be needed, which will help keep your spa performing at its best. As to exactly how often your filter needs to be replaced, this largely depends upon how often your hot tub is used. In general, a quality filter will last anywhere between two to five years if it has been properly cared for and frequently cleaned. For those that do use their hot tub regularly year-round, two to three years is the longest they should anticipate their filter to last. 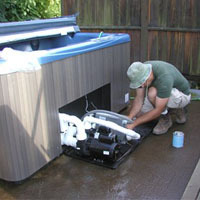 Aside from regular wear and tear, the kind of water used in your spa can influence how often a filter must be replaced. Hard water will cause calcium deposits to accumulate on the filter, which although not noticeable when you’re in the water, will cause the filter to deteriorate considerably quicker. If you ever notice that your filter has turned into a brownish or green shade or begins to fall apart as you are cleaning it, then replace it immediately. Finally, never use regular household cleaning products to clean your spa filter. If you are unsure of whether it is time to replace your filter, give your local hot tub dealer a call. To discover more about how to look after your new hot tub, download a hot tub buyer’s guide here.